If your C: Drive died tomorrow, how much work would, sweat and tears will it take to restore your computer? This is not where you keep the data, mind you, this is where you install software like Adobe Creative Cloud, Capture One, Presets and Filters, Office and all the other utilities you use. There is a solution! You probably have dozens, if not hundreds of small apps, third party attachments, plug-ins, software etc. You might not need or use all of them, but if you’ve ever had to install everything from scratch before, you know what a tedious process this can be. Personally I had a problem with a RAID drive in my computer, and I honestly thought to myself, what’s the big deal, there’s no data on their anyway. But as I began to realize what a pain it was to rebuild my system, I noticed I never wanted to go through it again. I decided to log everything I install. By creating numbered folders as I recreated my system I could always be prepared for the next C: drive failure. It starts with the basic drivers you need to functionally use your computer, WLAN/Ethernet drives, GPU drivers, USB drivers, etc. 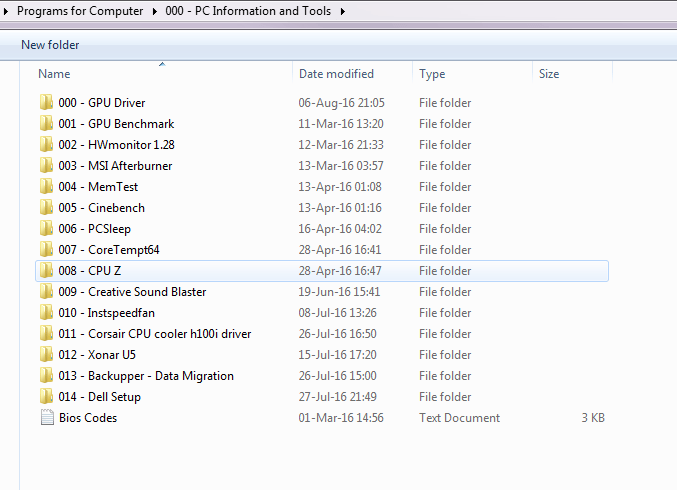 This is what I call the system tools. Everything you need for your computer to get it going. Benchmark Apps like Cinebench, monitoring programs like MSI Afterburner, screen drivers and all that other stuff you need to make sure your system is running appropriately. I personally have all of those files stored on my windows installation thumb drive as it makes it easier to really get my system up and running. I also have in there a list of Bios Codes that I used to help me troubleshoot any problems while starting up. Every time you download an installation file you add a numbered folder and put the installation inside (Even if I unzip a file I leave the file there). Save any licencing keys in that folder too. If you’re unsure if an app will stays with you, still keep a folder with the installation so that if you see you keep it, you can migrate it with ease to your collection. Before making any changes to your computer hardware or big software changes (operating system, bios, registry) copy/update your backed up system to an external hard drive or thumb drive (mine weighs about 60gb, but I’m sure if I cleaned it up a bit it would weigh around 30). Create Root folders for things that have third party apps. E.g. my Photoshop folder contains all my plug ins for Photoshop. If your computer dies, just go via the order in which the folders are numbered and re-install everything. It would still take a decent amount of time, but at least it would be an orderly and methodical process. Adam Frimer is a photographer and a filmaker based in Israel. You can see more of his work on his Instagram. Simpler solution, do windows snapshots. I’ve restored systems a couple of times from them and works out of the box within minutes. Do a search in Windows for System Image Backup, to recover your system all you have to do is get your boot image into the Repair mode and point to the external drive or NAS. I also run version control though Windows. I have the same software, and It’s very simple and fast. This is helpful if something crashes within 6 months. But most apps rev versions often enough that saving zip files of the original downloads may not be the most efficient way to get back going. Plus, having to rebuild a drive isn’t really that bad, and is a nice way to cleanse oneself of useless one-time-use utilities we regret buying. Install an application like allmyapps or ninite.